Can you read poetry to babies and toddlers? Of course! Kids ages 3 and under will be a most receptive audience. When you stop to consider the matter, you will notice that most good books for babies, toddlers and even preschoolers are written in rhyme and with a pleasing rhythm. I loved reading poetry to my babes in arms. When my boys were infants, I could get away with reciting Shakespeare during diaper changes in between rhymes about toesies and poesies because I knew it was all about the sound of my voice. Later on, in the toddler years, it was less about the Bard and more about Mother Goose! 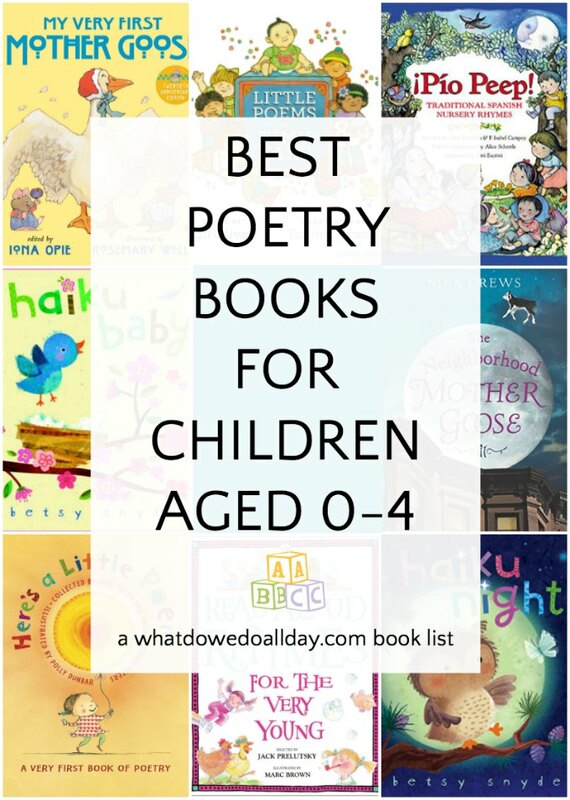 I’ve curated a list of the best poetry books to read to babies and toddlers. Little ears will cherish hearing their caregivers’ voices reciting these poems. 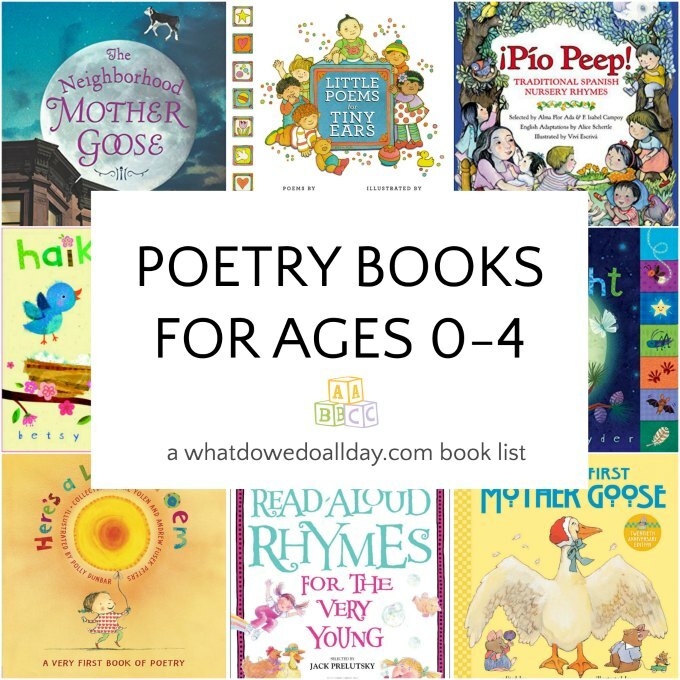 In this round up you will find traditional Mother Goose nursery rhymes that every child should hear, formally structured poems like haiku, and collections of a variety of verses. I’ve even included a bilingual poetry collection. And if you do want Shakespeare suggestion, check out the last poetry books for tiny tots on the list! Here’s A Little Poem: A Very First Book of Poetry ed., by Jane Yolen and Andrew Fusek Peters. Bet you never expected to be reading a verse by Gertrude Stein to your wee one! I adore this collection of unexpected poems for kids ages 0-3, and they are will be enjoyed by preschool-aged children, too! Yolen and Peters have filled this compilation with poems by stellar poets like A.A. Milne, Langston Hughes and Robert Louis Stevenson. It really is impressive how well-chosen the poems are and how delightful they are to read. You won’t find another collection like this and Polly Dunbar’s whimsical illustrations just increase the magic! Haiku Baby and Haiku Night by Betsy E. Snyder. Each poetry book is a darling board book with 6 haiku poems about nature and animals. I really loved how Snyder uses onomatopoetic words which naturally appeal to babies and the collage illustrations are colorful and sweet. The chunky tabbed pages are easy to grab when your toddler wants to turn the pages herself! Little Poems for Tiny Ears by Lin Oliver. This is a sweet collection of poems that address very important baby concerns. Concerns like wiggling toes, stroller outings and discovering oneself in the mirror! I love how Oliver uses word play and rhymes and dePaola’s cheerful illustrations of a diverse group of babies and toddlers is the perfect accompaniment. The Neighborhood Mother Goose by Nina Crews. Nursery rhymes don’t have to be illustrated with pink bunnies and delicate yellow flowers! Crews’s photographs of a diverse group of children experiencing the daily joys and events of everyday life accompany a selection of traditional Mother Goose rhymes. I love Crews’s interpretation of each poem in her photographs. For Pat-a-Cake, a pari of girls play a hand clapping game in front of a bakery window; for Pease Porridge, siblings make soup and so on. Tots love to look at photographs of other children and they will be captivated by these scenes from Brooklyn. Delightful! Read Aloud Rhymes for the Very Young ed. by Jack Prelutsky. This was a staple in our home when my kids were tots. Children love bouncy rhymes, clever word play and humor and Prelutsky knows this! The collection includes both classic and contemporary poems about the things kids care about–bedtime, picnics, family, baths, food and more. Exuberant illustrations cover ever page. My Very First Mother Goose. I bet you can already recite a dozen nursery rhymes from memory. This oversized book with Well’s signature illustrative style is great for a lap sitter but unlike a traditional picture book, you won’t be reading it all in once sitting. That’s okay! Curator Iona Opie has included both familiar and not-as-familiar Mother Goose rhymes. Many of them were new to me but quickly became fast favorites that I enjoyed reciting at bath time, on the go, or whenever the spirit moved me. ¡Pío Peep! : Traditional Spanish Nursery Rhymes ed., by Alma Flor Alma, F. Isabel Campoy and Alice Shurtle. This bilingual collection of nursery rhymes is not to be missed. Each traditional rhyme is present both in Spanish and in English. If you are not fluent, but had a little bit of high school Spanish, try reading aloud the Spanish version, your babe will love the sound of the word flow and rhythm and hearing another language is great for the brain! Behowl the Moon and The Wild Waves Whist by William Shakespeare, adapted by Erin Nelsen Parekh. If you do want to recite Shakespeare to your babes, these are the books for you! I first shared these on Instagram with the caveat that usually I am not into gimmicky “classics” for babies books, but I love these! Instead of attempting to summarize the plot of the plays, the author and illustrator have lifted text from the plays and created a story through the illustrations. I know you already have a few Mother Goose varriations but Mary Engelbreit has a nice compilation of Mother Goose rhymes (maybe 100 or more).